Lion's Tail is a striking autumn blooming perennial. It is particularly gorgeous when planted with other late summer bloomers like Mexican Bush Sage, Salvia leucantha and Tangerine Scented Marigold, Tagetes lemmonii. This Lion's Tail is in deep shade on one side and sunshine on the other. The side that is in the shade is a bit wild and squirrely as the branches attempt to find more light. The branches in the sun are more erect which is tidier. Lion's Tail originates in South Africa so the more sun the better. When grown in full sun the plants can reach six feet or more and are amazing to see. 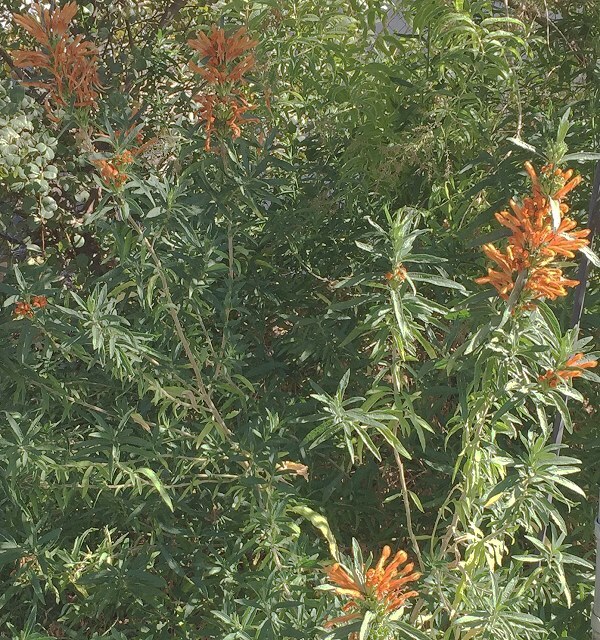 The flowers of the Lion's Tail dry very well and can keep their color for two years or more. They make interesting focal points for fresh wreaths. 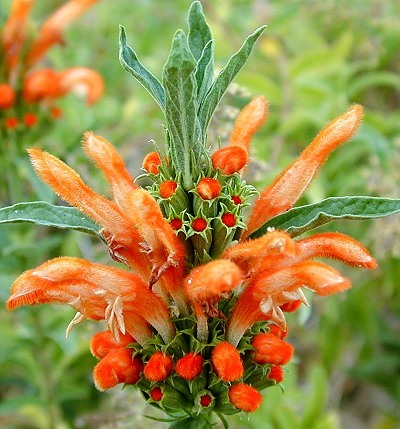 Which makes Lion's Tail a great addition to our Crafter's Herb Garden Six Pack for those who garden in zones 8 and up. Even in zone 8 it will die back to the ground in the winter which is a good time to cut it back. This plant is sometimes available in plug trays. These trays hold 128 of all the same plant. They are a great low cost way to fill a lot of space. Each cell is 3/4 of inch by an inch. Check here to see if Lion's Tail Plug Trays are available.